When your luck's out your luck is out. Nothing is falling for the Clarets at present and goalkeeper Joe Hart can testify. The former England international was beaten by a wicked deflection at the London Stadium as Felipe Anderson restored West Ham's lead late on with a little help from Ben Mee. And the same happened again as Newcastle United got their noses in front early on at Turf Moor on Monday evening. After the game got underway, with kick off delayed for half-an-hour due to Eddie Wolstenholme, referee Anthony Taylor's assessor, falling ill, the Magpies claimed the advantage. Having won a corner fortuitously, as Mohamed Diame's strike headed for the stands before Mee's head altered its course, there would be even more fortune in what followed. Federico Fernandez stroked the ball goalwards without conviction from the edge of the penalty area only for Mee's inadvertent intervention to take the effort away from Hart as it travelled in to the top corner. Burnley, statistically, are one of the least creative teams in the Premier League but they did manufacture a couple of opportunities to get back on level terms. Chris Wood failed to steer Matt Lowton's deep cross on target when the striker dropped beyond DeAndre Yedlin while goalkeeper Martin Dubravka's stop to deny the New Zealand international's attempt from distance was unconventional to say the least. However, disaster struck midway through the half when the visitors extended their lead. Matt Ritchie reversed the angle when retrieving a short corner and skipper Ciaran Clark found the hinterland between Mee and Lowton to flick the cross in to the corner of the net. 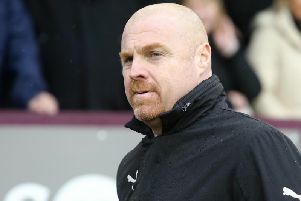 The game seemed done and dusted but you can never write off a Sean Dyche side and with five minutes of the half remaining they gave themselves a lifeline. Sam Vokes, who was stalking Clark, pointed to where he wanted Mee to play the ball. The Clarets captain obliged with the diagonal from deep and the Welshman utilised every muscle in his neck to loop a stunning header past Dubravka. The effort was measured at 17.65 yards, the furthest distance for a Premier League headed goal since Leicester City's Jamie Vardy netted against Sunderland in 2015. The home side could have equalised before the break but Dubravka produced a save for the cameras to turn Wood's half-volley over the top once Vokes had cushioned Lowton's pass. Burnley had a huge let-off after the break when Ritchie was guilty of producing one of the worst misses in Premier League history. After Hart denied Yedlin with his toe the ball broke to the Scottish international who, somehow, managed to fire wide unchallenged from inside the six-yard box. Wood rifled the ball down Dubravka's throat after Vokes had done well to shield the ball inside the box and the former Leeds United forward was thwarted by Yedlin after spinning on Brady's pass. Wood should then have done better when Aaron Lennon pulled Brady's cross back towards the penalty spot but last season's top scorer in all competition's sliced wide of the target. Substitute Joselu had the chance to seal it as play opened up when latching on to Ayoze Perez's through ball but the Spaniard's attempt came back off the post. The Clarets had one final chance in the dying embers of the game. It was last chance saloon from Charlie Taylor's set-piece from the right hand side of the area but Vokes's header, which sailed over, was greeted by the final whistle. Burnley remain a point ahead of the bottom three. Heading in to Saturday's game against Crystal Palace at Selhurst Park they're stuck on nine points, 13 less than at this stage last season, and they've shipped 17 goals more.